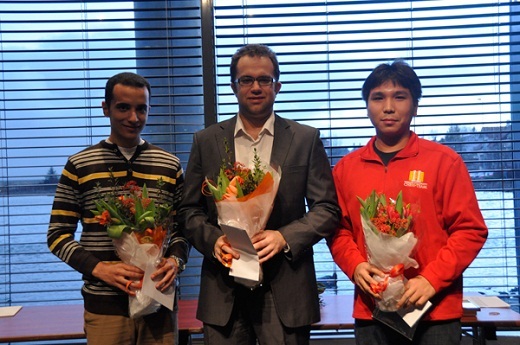 The Reykjavik Open came to an end. 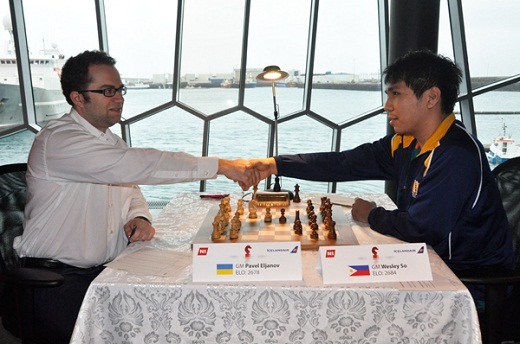 Pavel Eljanov and Wesley So arrived to the last round as leaders and it took them just 3 moves to sign a draw. The players decided to go for a share of the first prize instead of risking losing it all. Out of the six players that were in position to catch up with them, Egyptian GM Amin Bassem was the one who joined them at the top. Ivan Cheparinov played against the youngest GM in the world, Wei Yi. The Bulgarian was a rook down, but had two pawns and the initiative for it. At move 37, he went for a perpetual check to save the draw. Anish Giri was an exchange down against Gawain Jones, and the Englishman even had the initiative, but the first seed was able to equalize and finish the tournament with a very respectable score of 7.5/10. Polish GM Grzegorz Gajewski had a very good tournament before the last round, but was not able to hold Amin Bassem in today’s round. The Egyptian played with white and the players went into an interesting line arising from the Sicilian Defense. Amin Bassem won a pawn, but it did not seem enough to get the full point. Gajewski made some inaccuracies in the rook endgame and the Egyptian eventually won the game after 52 moves.